Hand sanitizer is a fluid generally used to decrease infectious agents on the hands. Formulations of the alcohol-based medical grade type are preferable to hand washing with soap and water in most situations in the healthcare setting. It is generally more effective at killing microorganisms and better tolerated than soap and water. Hand washing should still be carried out if contamination can be seen or following the use of the toilet. They are available as liquids, gels, and foams. 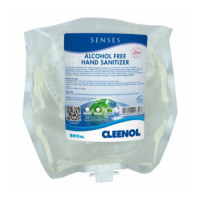 Senses Alcohol Free Hand Sanitizer is a mixture of effective biocides,..
A clear alcohol based unperfumed hand sanitizing gel for use in any si.. Ideal for use on entering food production areas, or before handling fo..
An alcohol based product for use in any situation where bactericidal c.. 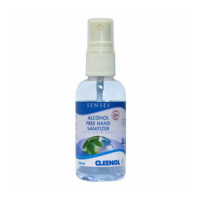 Senses Alcohol Free Foaming Hand Sanitizer is ideal for use on enterin..
Cleenol Spray Hand Sanitizer is a fast drying spray hand sanitizer. Id..